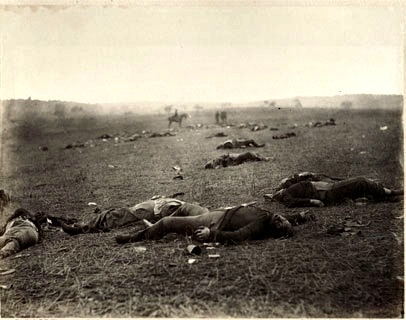 Gettysburg Battlefield was the scene of one of the most horrific battles of the American civil war. Fought between the 1st and 3rd of July, 1863 over an area of 4 acres from where the first shot was fired at Knoxlyn ridge. The battle between the Union and Confederate troops devastated both armies, leaving almost 9000 dead and over 20,000 wounded. The battle is considered the most important battle of the war, where the union General George G. Meade faced of against General Robert E. Lee who after a recent crushing defeat against another union army began his invasion of the north. The major turning point of the battle was known as Pickett’s Charge, which managed to pierce the Union lines but eventually failed, at the cost of thousands of rebel casualties, forcing Lee to withdraw his battered army toward Virginia on July 4. Today the site is a popular tourist attraction and host a number of memorials and museums. As you can imagine with such a brutal battle in a time were medical treatment was sketchy at best, the number of dead and people who suffered on these grounds is more than enough for the foundation of a good haunting. Many battlefields are thought to be haunted, with ghosts often appearing in in groups or in formations, and Gettysburg is no different. The shear number of apparitions spotted here is huge, photos and video of ghosts on the battlefield are common across the internet, and its is considered one of the most haunted places in America. Soldiers from both sides wearing their uniforms are the most common sighting, with stories of everything from faint mist like outlines of troops, to full lines of marching men. EVP can be caught here on what seems like quite a reliable basis, and many stories exist of people hearing gun fire and cannons from unknown sources. Accompanied with the disembodied screams and moans of dying men this is one area which has truly scared many visitors. The buildings involved at the sight of the fighting are also quite haunted, including the Farnsworth house Inn and the Gettysburg college where all kinds of activity has been reported. The Farnsworth house Inn is thought to be the home to some particularly terrifying voice phenomenon, with screams and moans so loud it has woken people up and caused many terrified visitors to flee the area.